Researchers have mapped the mouse brain metabolome. Researchers at the University of Luxembourg have successfully measured metabolic profiles, or the metabolomes, of different brain regions in mice. The metabolome represents all or at least a large part of the metabolites in a given tissue, and thus, it gives a snapshot of its physiology. The team state that their findings could help better understand neurodegenerative diseases and could offer new ways to intervene therapeutically. In addition, they add that with the help of metabolic profiles such as those measured in the current study the efficacy of novel therapeutic interventions could be tested more efficiently than with more common approaches. The opensource study is published in the American Journal of Pathology. The researchers explain that neurodegenerative processes, such as those occurring in Parkinson’s disease, are characterized by pathological alterations of the brain cells; these cells lose their structure and function, a process that is accompanied by changes in their metabolism. In previous studies scientists have focused on just one or a few aspects of the disease to better describe and understand the underlying mechanisms. By analysing the whole metabolome however, the researchers can analyze hundreds of biomolecules produced by nerve cells in upper, middle, and lower brain regions of the mouse. In the current study the researchers were able to analyze healthy brains and brains in which neurodegeneration occurs. To study the metabolite signatures of the brain, the current study used gas-chromatography coupled to mass spectrometry. This approach is particularly suitable for the analysis of samples from complex tissues, explain the team. With metabolic studies one can assess known and still unknown biomolecules in tissue samples. After the measurements the researchers used a bioinformatical approach known as Machine Learning to specifically derive the metabolic profile of each brain region. The data findings showed a multitude of different molecules together reflect a specific functional state of nerve cells in each brain region. By comparing their observations with microscopic analysis of pathologic processes in nerve cells, the researchers showed which particular metabolic profile is associated with the degeneration of these cells. The team state that the results are important for paving the way for the discovery of novel therapeutic opportunities to combat neurodegeneration such as Parkinson’s or Alzheimer’s. Indeed, the data findings show that by analysing metabolite profiles rather than just microscopic cellular changes or individual biomolecules a better understanding of the effect of novel therapeutics for brain diseases should be feasible. Neurodegeneration and gliosis induced by kainic acid (KA). Mice were injected with 20 mg/kg KA or vehicle (VEH), and euthanized 2 or 7 days later. 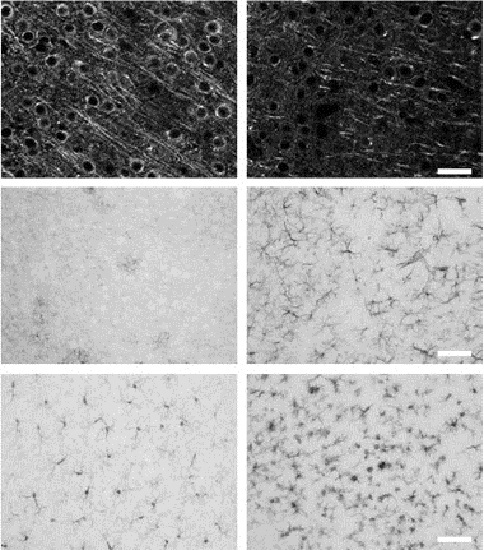 Histological quantitation of neurodegeneration was performed on fluorescently labeled microtubule-associated protein 2 (MAP2; neuron dendrites and cell bodies) sections. Quantitation of gliosis was performed on immunoperoxidase glial fibrillary acid protein (GFAP; reactive astrocytes) and ionizing calcium-binding adaptor molecule 1. Qualitative images show examples of MAP2, GFAP, and IBA1 immunostains on VEH- or KA-treated mice. Results obtained for the synaptic markers synaptophysin were similar to those of MAP2. The extent of neurodegeneration and gliosis was similar at 2 and 7 days, probably a reflection of the high sensitivity of the FVB/N mouse strain to excitotoxicity. The Mouse Brain Metabolome. Buttini et al 2015.